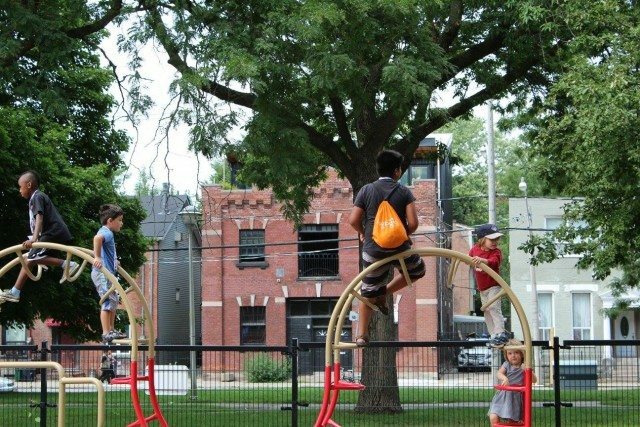 Who's Really Using Moss Park? Who’s Really Using Moss Park? New portrait project reveals the area's residents and their stories. Aliya and one of her children, residents of Moss Park. Photo by Alma Ahmed. Yasin Osman is no stranger to witnessing a neighbourhood in transition. The 20-something first dabbled in photography by documenting the subtle changes in Regent Park. With his mother’s cellphone, he focused on the smallest details—a windowless frame, a disappearing door. Taken together, those negligible details dramatically alter a landscape, once the dilapidated buildings are torn down. Osman was among eight artists recruited by The 519 LGBTQ community centre and the City of Toronto for the Moss Park Portrait Project. Local artists were dispatched around the park and its surrounding streets to capture everyday life in the area over the course of 17 hours. The portraits will eventually be displayed chronologically, to show who visits and uses the park throughout the day. The event, held on August 27, was part of The 519 and the City’s latest round of public consultations over the fate of the John Innes Community Recreation Centre. It’s touted as an effort to capture the community’s mood and gather feedback on the proposal. With an estimated $85 to $100 million at stake, the proposed plan is to reconstruct the centre, which is situated on park grounds, and to transform its wider surroundings. Osman got involved with this particular project to show a different side of Moss Park, and was selected based on his ties to the community. He often runs informal workshops for youth from Moss Park and Regent Park—the neighbourhood poster child for inclusivity—which received a $1-billion cash infusion for redevelopment. With Moss Park also on the verge of a massive makeover, comparisons to Regent Park and concerns about gentrification are unavoidable. Through the portrait project, 519 community organizer Curran Stikuts says organizers hope to better understand and convey how the people use the park. Portraits, intimate as they are, can offer a penetrating look into a person’s character. In this particular case, they force viewers to see past the hard edges of Moss Park, to look beyond the hardscrabble life we assume residents lead. They bring us into contact with everyday folk who have deep ties to the neighbourhood. On the playground at Moss Park, Osman photographs two school-aged boys posing in the middle of a concrete splash pad. (The two boys are accompanied by their mothers, who happen to be friends as well.) The playground, he says, is the heart of every community. And it’s no different at Moss Park, even though it is fenced in with a wraparound gate coated in black paint and City signage barring the occasional the childless and wayward soul from entering. Still, it’s hard for Moss Park to shake its image of a poor neighbourhood in need of fixing. But its residents, through the portraits and accompanying stories, reveal the truth: for all the grit and grinding poverty, to many residents, it’s not necessarily a place of last resort. Ginger and her son, Philip, moved to Moss Park from Scarborough about four years ago. While she is acutely aware of how others perceive the neighbourhood, Ginger prefers living in Moss Park to Scarborough, where she felt isolated. Her old routine consisted of shopping for groceries, working, and heading home. Here, at Moss Park, with its central location downtown, she walks everywhere, averaging 26,000 steps a day, as the app on her phone indicates. Moss Park is also close enough to Regent Park, where she takes her son for swimming at Daniels Spectrum. The facilities there are not only newer, but less crowded, she notes. With talk of redeveloping Moss Park and its community centre, Ginger wants to see more arts programming for her son, who enjoys playing the piano and cooking. There’s a long and growing list of ideas residents want to see implemented: a community kitchen and spaces for community meetings, to name a few. But at the top is how the area can remain a refuge for all residents, not just refugees and newcomers, but also “street-involved” individuals who depend on the social services in the area. Stikuts admits they are still grappling with answers on how best to look after—and protect—the interests of the community. The strength of the community, he says, is how much it embraces people from all walks of life. Frederick Law Olmstead, the father of the public park system, intended for parks to be a democratic space. In reality, however, the manicured park remains the preserve of the relatively well off, while low-income neighbourhoods often make do with seedy parks. 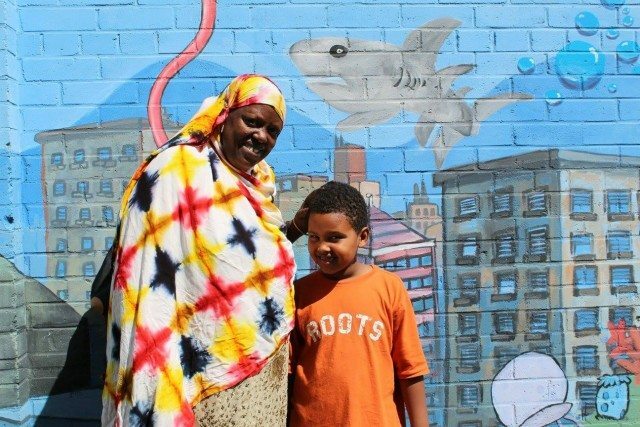 Residents carve out safe spaces for children to play and community artists enliven the space with murals that reflect the area and its residents. Moss Park is perhaps one of the closest approximations to Olmstead’s idealized public park, if only for the fact that it’s accessible to a diverse group of people. Sherbourne Street, where Moss Park intersects, was once described as a microcosm of the city at large. And that remains so—you don’t need to look far afield to notice that across from the park, the Indigenous centre occupies the same block as a dog boutique. 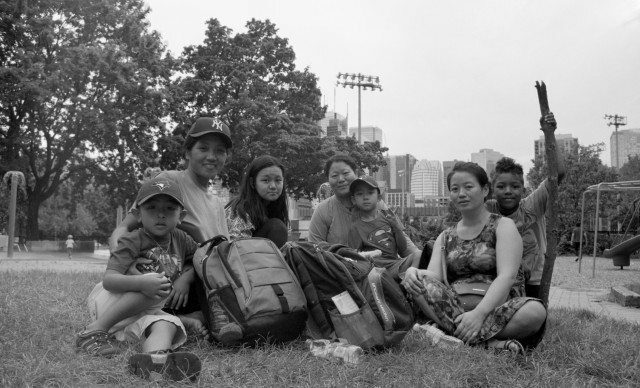 Take it as another unmistakable sign of gentrification, but at this point, social-service agencies haven’t yet shuttered and community groups are defending their right to stay. And if, when the dust of redevelopment settles and the two businesses are still standing, the sight may appear less incongruous.